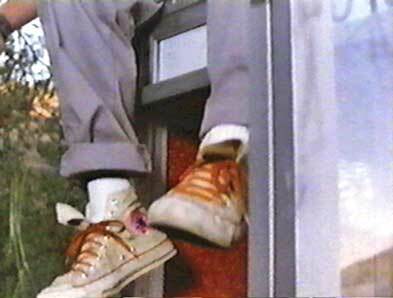 Keanu Reeves and Alex Winter wear black and natural white high top Converse “Chuck Taylor” All Stars in the film. 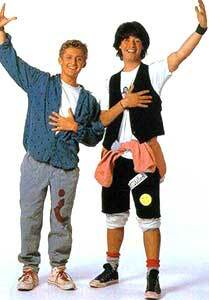 Bill and Ted change the world with their San Dimas attitudes and life-style. Bill & Ted’s Excellent Adventure is a combination comedy and science fiction/fantasy that presents the viewer with an interesting premise: What if the actions and words of a pair of southern California teenagers are actually important to the survival of the world? This strange idea seems doomed to failure when we meet Bill Preston (Alex Winter) and Ted Logan (Keanu Reeves) for the first time. The two teens are nice enough guys but apparently are real airheads when it comes to academics, and if they don’t achieve an A+ on their upcoming history oral presentation, they will flunk world history and Ted will be shipped off to military school by his policeman father (Hal Landon, Jr.). Their vocabulary consists of phrases like “be excellent” or “most heinous” to describe good and bad things, and playing air guitar is one of their main ways of responding to adversity. Bill and Ted’s main interest and avocation in life is to form a successful metal-like rock band, but they have one major problem: neither Ted nor Bill can actually play the guitar with any skill. As the film opens, the boys are panicked by the fact that their oral exam is the next day, they haven’t prepared, and don’t have a clue about how to begin. Their families don’t provide them with any support — Ted’s father is looking forward to sending him to the military academy in Alaska (which will break up their friendship and band) while Bill’s dad (J. Patrick McNamara) is more interested in making out with his well-endowed young new wife Missy (Amy Stock-Poynton), who is only a few years older than Bill and Ted. When Bill tells his dad that he is about to fail history “most egregiously”, his dad’s reaction is to slip the boys a few dollars to go take a break so he can be alone with Missy. 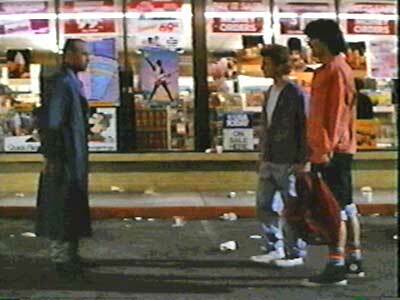 Bill and Ted meet up with Rufus, an emissary from the future. 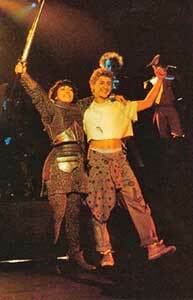 But fate is about to give Bill and Ted a major break. While at the local mall on their break, they run into Rufus (George Carlin), an emissary from the 26th century who has brought them a time-travel device in the form of a telephone booth. Rufus tells the boys that their music, vocabulary, and life style is the basis of all that is important in the society of the future, and that they are to use the phone booth to observe history and bring back people of importance to help them with their oral presentation so that the society of the future will continue to exist. So Bill and Ted go off in the time machine and bring back Napoleon (Terry Camilleri), leaving him in the care of Bill’s younger brother. Their next trip is more efficient, and you see them travel through time to obtain a variety of figures from different times and societies in order to meet the requirements of the oral report. They bring back Socrates (Tony Steedman) from ancient Greece, Billy the Kid (Dan Shor) and Abraham Lincoln (Robert Barron) from 19th century America, Genghis Khan (Al Leong) from Asia, Ludwig van Beethoven (Clifford David) and Sigmund Freud (Rod Loomis) from Vienna, and Joan of Arc (Jane Wiedlin) from medieval France. On the way they also stop in feudal England, meet two beautiful princesses (Diane Franklin and Kimberley LaBelle), are captured and nearly killed in the process before they are able to escape. More complications ensue as events from the past, present, and future affecting Bill and Ted intersect and change things, the historical characters visit the San Dimas shopping mall, create an uproar there, and are arrested by the police, and the boys struggle to recue their historical guests from jail and stage their oral presentation by the scheduled time. The resolution of these issues makes up the balance of the film. 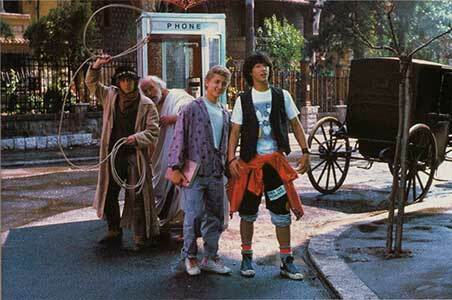 Bill and Ted go back in time and bring Billy the Kid and Socrates to help with their history report. Bill & Ted’s Excellent Adventure works as a film because it provides us with humor on a number of levels. The film is actually great family fare because it doesn’t contain a lot of profanity, gratuitous violence or sexual activity and provides audiences of all ages with a pleasant time. The film is clearly an important influence on humor of the nineties when you think of subsequent projects like Wayne’s World. Keanu Reeves and Alex Winter make a great comedy team and their valley dude act and vocabulary becomes very humorous in the context of all of the historical figures we see. Could you imagine greeting Genghis Khan or Napoleon with the line “How’s it goin’, dude?” Another premise that works very well is the whole idea that the vacuous valley talk like “party on” and “be excellent” or heavy metal music from a teenage garage band actually becomes the mantras of a future society. And finally a lot of humor is made from taking famous historical figures and inserting them into contemporary American suburban society. When we see Napoleon downing a huge sundae at an ice cream store, or delighting to the tidal wave at a water theme park, Beethoven jamming on modern music synthesizers at a shopping mall, Billy the Kid and Socrates learning to play Nerf ball, and Joan of Arc getting into aerobic dance, it becomes an interesting commentary on our society and what the impact of common things we take for granted will have on the future. And it provides us with the more subtle idea that maybe the preceptions and attitudes of this generation will have some importance in our future, and that the teenagers of today eventually may amount to something in our culture. Bill and Joan of Arc impress the people of San Dimas High School. 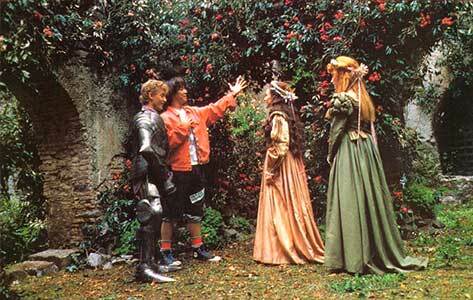 Bill and Ted meet their future girl friends while time traveling in the Middle Ages. Bill and Ted both wear Chuck Taylor high tops and their contemporary suburban style of dress makes a statement in the film. Bill wears natural white hightops with red laces along with baggy jeans, white t-shirts, and cutoff sweatshirts or loose sweaters. Ted wears black hightops with blue laces, gray thermal socks with a large red stripe, black surfer shorts over white cutoff sweat pants, white t-shirt, and black vest. More could have been said in the film about their striking appearance, especially when they go back in time. Their appearance would certainly be a topic of conversation in previous centuries when clothing like this didn’t even exist, and it’s too bad that nothing was made of this opportunity for humor in the course of the film. Probably the best chucks scene in the film was when Bill and Ted stop in feudal England, and meet the two princesses, combining the above described chucks-wear with medieval armor. Bill comes down from the phone booth after fixing the antenna. Bill & Ted’s Excellent Adventure. (1989) Keanu Reeves, Alex Winter, George Carlin. Directed by Stephen Herek. Categories: Comedy, Teenagers, Science Fiction/Fantasy.